When the Empire starts looking around, you'll be ready when you wear these Chewbacca hands! These hands are made out of latex and have authentic details like wrinkles, painted-on fingernails, and a textured look to resemble hair. These oversized hands are 7 inches across the palms and 14 ½ inches long. 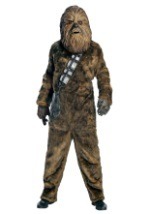 Your Chewbacca costume will finally be complete when you top it off with these latex Chewbacca gloves.